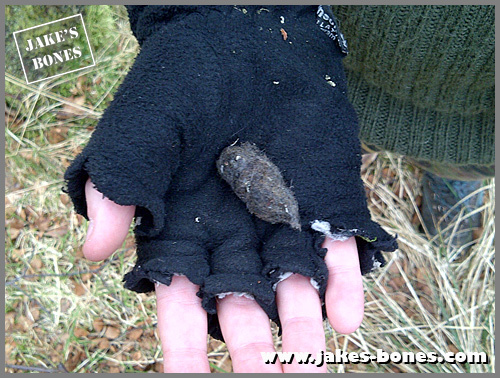 I'm not able to go on bone-collecting walks for at least another five weeks since I broke my leg, but this post is about the last walk I did before I broke my leg. 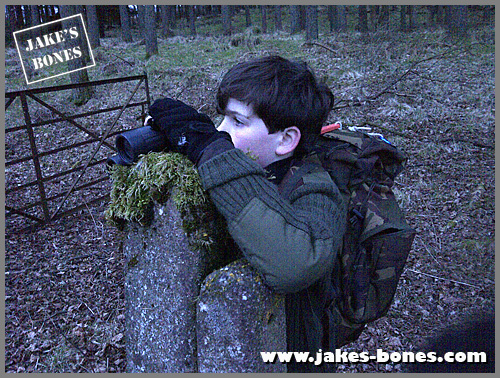 It was on a weekday after school, and in the Haggis Woods (where we did this post last year). The Haggis Woods are a long strip of woods which slope uphill with the A9 road at the bottom of them. I hadn't been there since last year, but I knew there would be roe deer there. Apart from that, I didn't know what we were going to find, but the end we found somewhere interesting to explore, found a mystery, and got a big shock ! 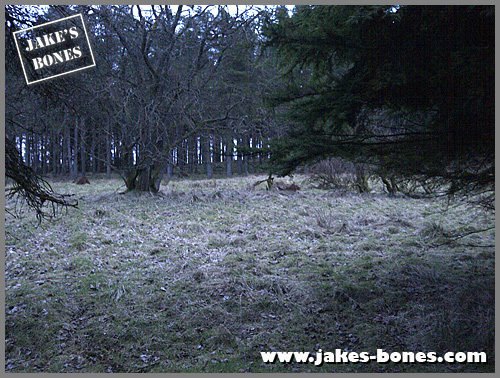 The woods are part of a massive moor near my house, which is a mixture of farmland, open land and woods. These woods are mainly pine, but are not very dense, so there is enough light and rain gets through the trees for grass to grow in the woods. 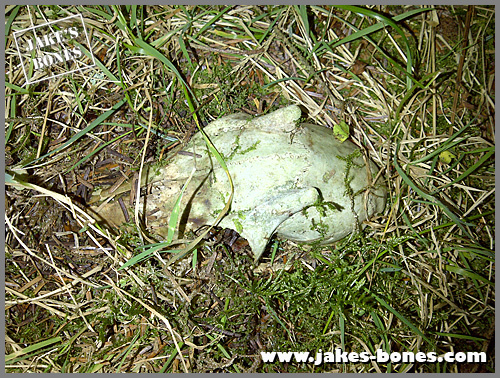 This is good for deer, who can eat without going into the open, but bad for bone collectors because the growing grass makes it almost impossible to spot old bones. 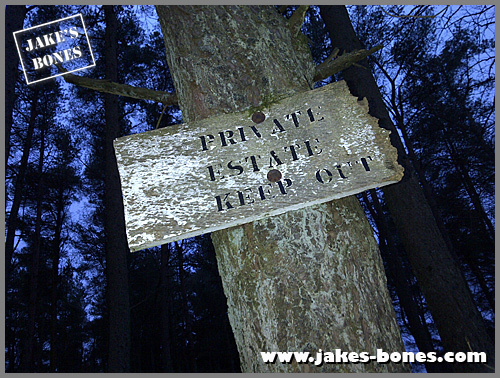 There is a sign at the start of the woods which says "Private Estate: Keep Out". In Scotland, you have always been allowed to walk on almost any open land or woods (I'm going to write a post about this soon) so you can ignore these signs. Dad and I decided to quietly walk up the easterly side of the wood. There were fallen down trees from the storm damage ahead, and we thought there might be roe deer in the woods after that that we could watch. We were close enough to the A9 to hear the traffic there, and there was what sounded like a huge lorry, except it kept getting closer and closer and louder and louder. Dad and I looked at each other and then looked up and we saw a huge Hercules RAF plane fly straight over the top of us, no more than 100 feet from the top of the trees ! Dad ran to the edge of the wood to get a picture. 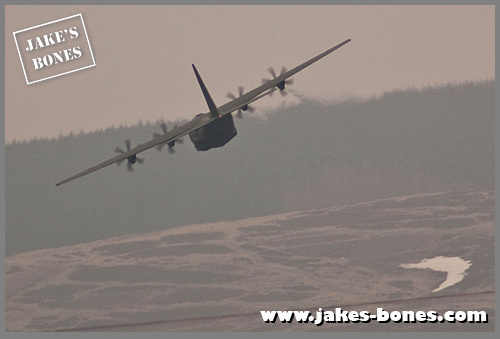 From the picture, he thinks it was a Hercules C-130J C5 which is a slightly shorter version. It was scary and cool all at the same time. We took a bit of a break, and kept on walking. 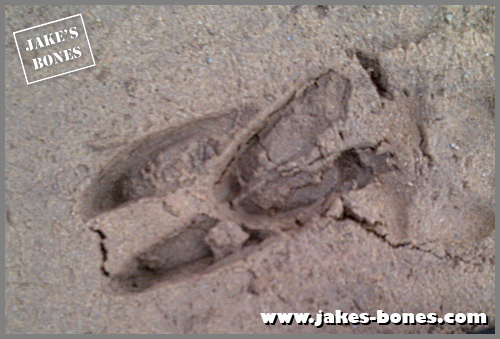 There were a few signs of roe deer (like these overlapping footprints, called 'slots') and we saw a few which ran away from us too quick to be photographed. 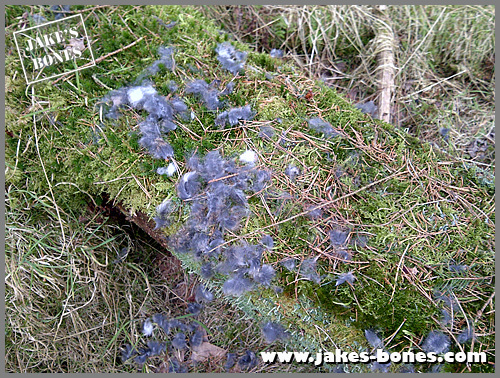 which is where a buzzard had torn off a dead rabbit's fur. Further up in the woods was a bit of a mystery ! 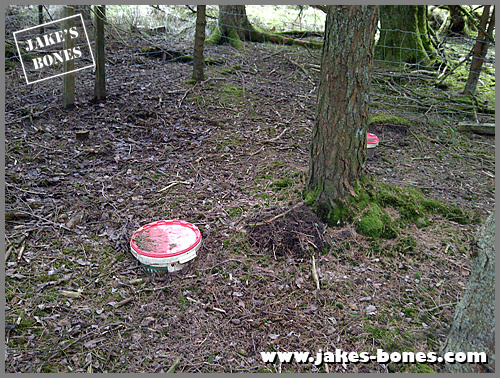 It was a fenced off area about 5m by 5m, with two partially buried pheasant feed tubs in the ground. I had never seen anything like this before. 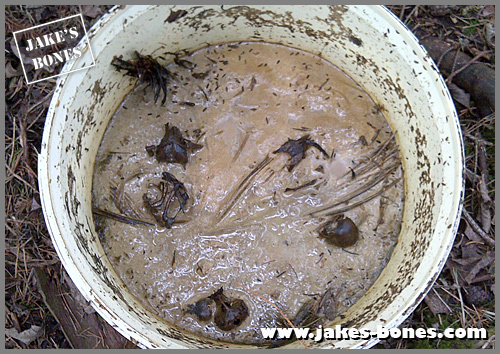 I carefully opened one of the tubs and inside was brown sludge with bird bones floating on top. It looked like dead birds had been thrown in with a little water to decompose. It smelt disgusting. I carefully put the top back on, because it's important not to disturb any equipment or traps in the woods that other people had left. I'm quite sure what it was for but my theory is it was a stink pit. 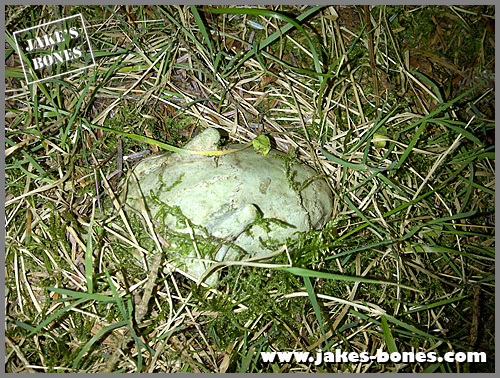 Gamekeepers use these to attract foxes with the rotting smell, and when the foxes come they shoot them. 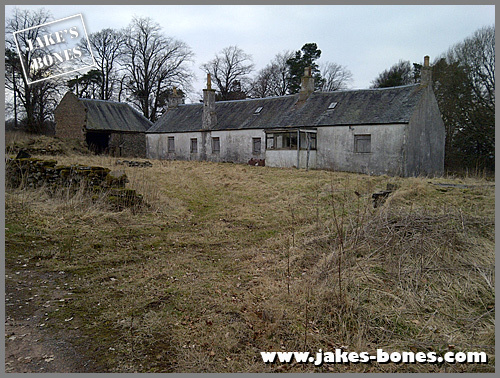 It was a small farmhouse with some outbuildings. 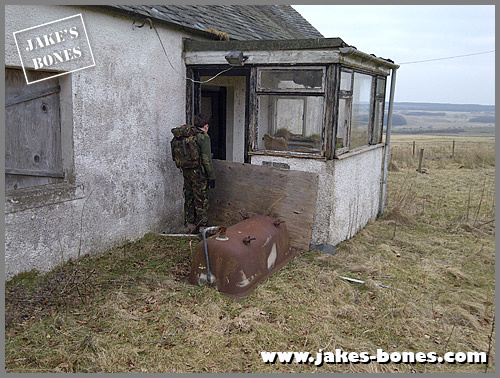 Like all the empty farmhouses round here, none of the doors were locked but a board had been put across the doorway to stop sheep going in. I always carry a torch in my pack, which I needed because all the windows were boarded. 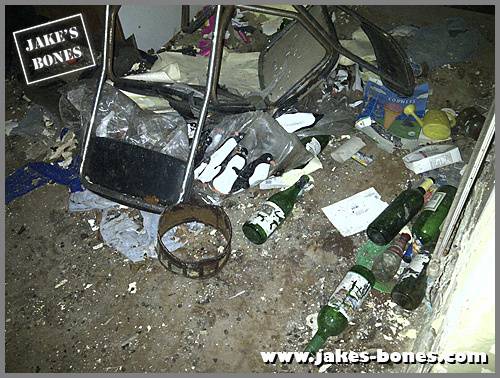 But the inside had been wrecked and there were beer bottles everywhere, which was a real shame. 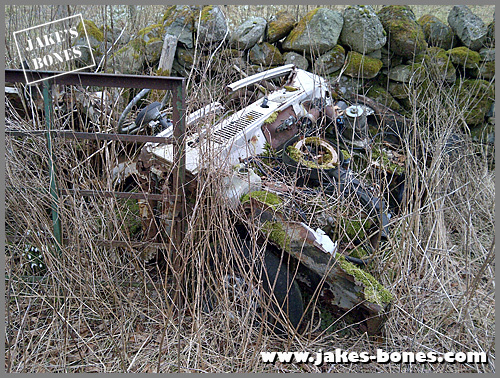 Outside there was an old cut-up Ford Fiesta, registration A952 ARG. That means it was from 1979/1980. 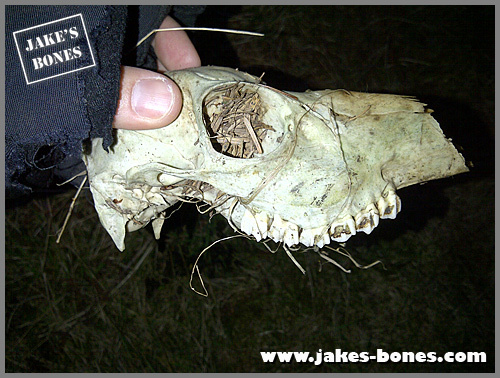 It was tricky to identify at first, but it was part of a fox cub skull, with the upper teeth. The cacnine tooth at far right hadn't emerged yet, so the fox would have died very young, but many do. 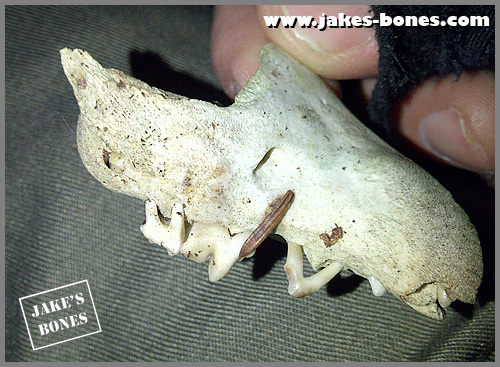 I hunted a bit more and found the lower jaws. He pulled it out a bit more and it was a juvenile male roe deer. The points on top are the growing pedicles, where the antlers will eventually grow from. It was a nice find so I brought it back to clean. 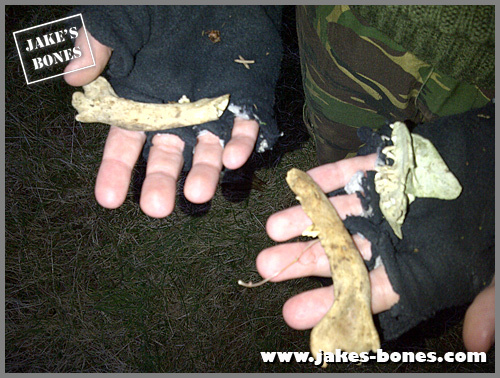 Then in the middle, close to the ree, I discovered why all these different bones might have ended up here. 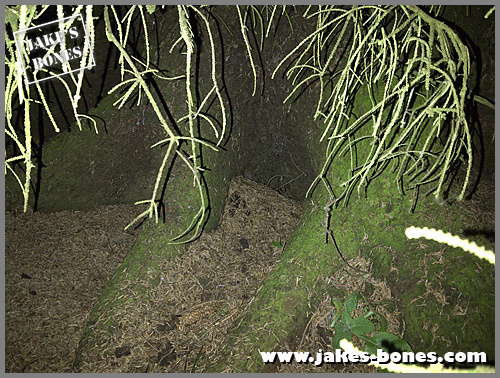 There was a fox den underneath the roots of the tree, where the parent foxes must have brought back food for the cubs. 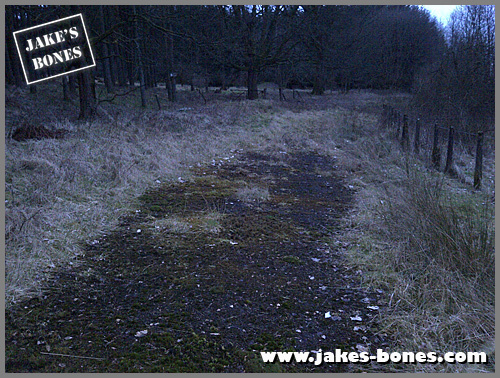 This must have been the original course of the A9, before the new dual carriageway was built ! Once this was the main route to travel to the north of Scotland. Now no-one knows it is even there. That was a good walk - but at the time I didn't realise it was the last walk I was going to do for at least a month ! 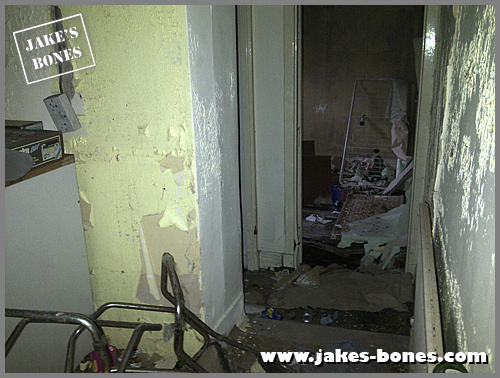 Love the old house! Great finds too! 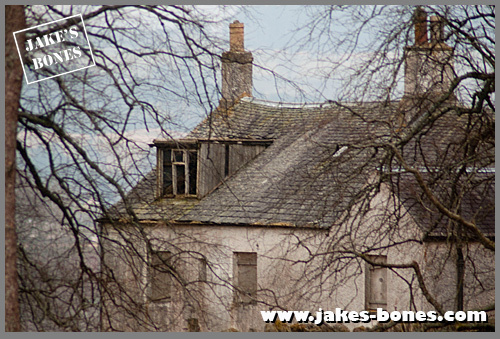 There's loads of old houses like that around here. I have to write a post about them all soon. Around my house we have some awesome old ruined mills from the 1700s.They have some cool secret passages and are built by a waterfall and some caves.What more could you ask for in a about 2 mile wide patch of woods?Although it is really rubbish for bones which is a shame. That sounds AMAZING ! I have lots of old buildings, some waterfalls, but no secret passageways.